About Us: We are family owned business that is price friendly for our neighbors. We have multiple purpose shop. We carry tobacco product, hookahs, e hookahs, e cigs, bongs, water pipes, glass pipe and much much more. We have beaten prices of any printing shops in Connecticut. We also can design for you as well just give us a call and we can provide you with a solution. with our expert designers your ideas will come to reality. You may also email us your idea. 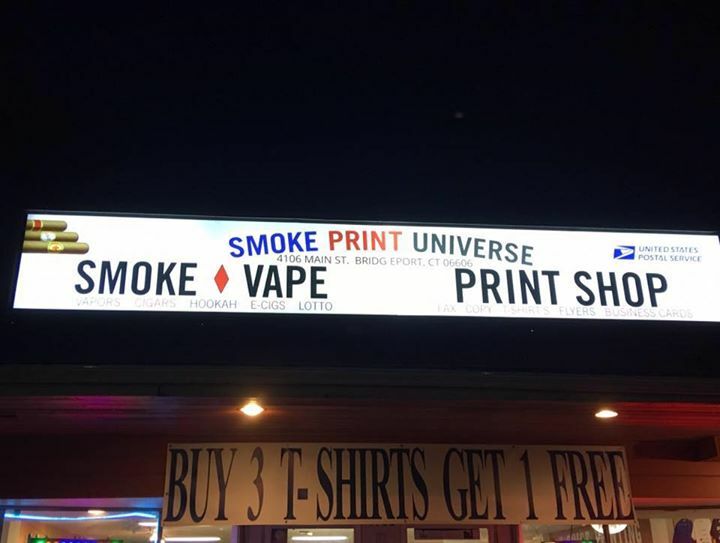 smoke.print.universe@gmail.com. We do almost every type of printing, such as, banners, posters, tshirts, billboards, name signs, copy, booklets, greeting cards and much more. 0 0 Smoke & Pr..
2 1 Smoke & Pr..
2 0 Smoke & Pr..
4 0 Smoke & Pr..
1 1 Smoke & Pr..
49 results, Page 1 of 5 pages.